This Sunday’s Psalm, for the feast of the Baptism of the Lord, is an interesting choice. Psalm 29 is the most emphatic of the Psalms about God’s power. But this Sunday, the liturgy emphasizes how his power is upon the waters. In Matthew, Luke, and John, the Baptism is the beginning of Christ’s ministry; in Mark, it is the beginning of the Gospel itself. It is the beginning of our Church year, and the beginning of our own life in Christ. The power of God on the waters. 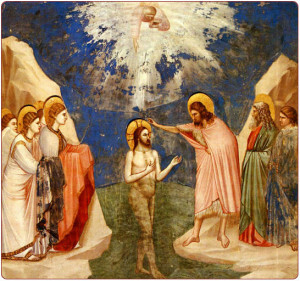 The Baptism of Jesus is mysterious. Surely there is more to be said about it, but maybe “it’s mysterious” is an okay way to interpret John the Baptist’s saying: “I need to be baptized by you, and yet you are coming to me? Jesus said to him in reply, Allow it now, for thus it is fitting for us to fulfill all righteousness.” No, it doesn’t exactly make sense for Jesus, the true Baptizer, to be baptized – but it is part of his saving plan. For our part, let’s focus more on what follows. “He came up from the water and behold, the heavens were opened for him, and he saw the Spirit of God descending like a dove and coming upon him.” What does Baptism do? It opens for us the gates of heaven. How? By sending the Holy Spirit. It is important to make this connection. Baptism “washes away” sin, and thus restores our path to heaven. But sin is a negation, an emptiness. Baptism “washes away” sin by filling us with God’s Spirit, God’s love. “A voice came from the heavens, saying, This is my beloved Son, with whom I am well pleased.” Baptism makes us pleasing to God not just by what it takes away, but by what it gives us: divine sonship. To say the same thing another way: the dove coming down on the waters recalls Noah. The point is that the reign of death is over. Life is restored. In our reading from Acts, Peter describes the Baptism of Jesus: “God anointed Jesus of Nazareth with the Holy Spirit and power.” Now, of course there’s something a little odd here: Jesus carried the power of God in his very person. And yet the point is, this is what Baptism does. It makes us Christians, conformed to Christ. It anoints us with the Holy Spirit and power. And then what happens? “He went about doing good and healing all those oppressed by the devil, for God was with him.” Not only is our sin washed away, but we begin to do good, to live the love of God, and to conquer the oppression of the devil. That’s what happens when God is with us. And thus Peter tells Cornelius and his household, whom he is about to baptize, and on whom “the Holy Spirit is poured out,” “I see that God shows no partiality. Rather, in every nation whoever fears him and acts uprightly is acceptable to him.” Our access to God is not by being a member of a club or doing a one-off trick, but by being members of Christ’s body, filled with his Spirit, and thus living as he lives: in the fear of God and acting uprightly. Baptism is the victory of justice: but the true victory of justice is not when people are condemned, but when people become just. The one “upon whom I have put my spirit, he shall bring forth justice to the nations.” When the Spirit comes, through Baptism, we are made whole, made good, made just and upright and godly. What does your Baptism mean to you? How do you celebrate it?